I have just listened to 'Viva Elvis' - The Album which was very kindly sent to my by SONY(UK) and I am not afraid to say I am in tears. It is PHENOMENAL and the sound AMAZING. Truly a listening and emotional experience and genuinely revolutionary in concept which should give it an excellent chance for a Grammy Award next year. 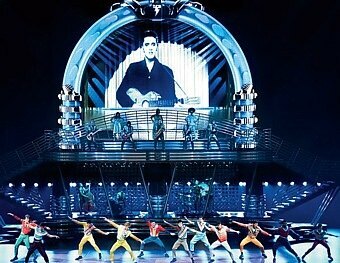 This is truly Elvis for the 21st Century. Yes, we would have liked more tracks but the ones on the album are longer than usual apart from 'Memories' and 'You'll Never Walk Alone' which are linking themes as shown below. I would also have liked to have had the names of the individual female singers featured on the duets. 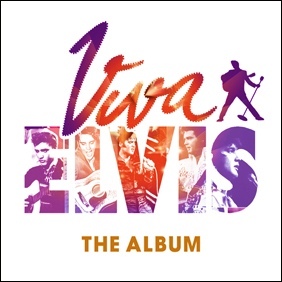 The album cover is very colorful, contemporary, and features a booklet containing many scenes from the 'Viva Elvis' show with details of the cast etc. The album opens with the strains of what is commonly known by Elvis fans as 'The 2001 Theme' together with females screaming and chanting "We Want Elvis". Great drums featured in the background. Elvis himself comments 'If You're Looking For Trouble'. There are also historical comments from Ed Sullivan and track 1 commences a countdown into track 2. A fitting start to the album. Commences with Elvis making comments in the recording studio to Hal Wallis. We are then treated to an excellent version of this well known track featuring drums/sax/piano/bass and organ. During the song a part of the arrangement is reminiscent of 'Barbara Ann' by The Beach Boys. Elvis comments "It's Hot In Here". Ends with a great Boots Randolph style sax. A contemporary version without losing the original feel. This would be a great track for the programme 'Dancing With The Stars'. Commences with the famous comment made by Elvis (on the 'Elvis sails' EP) to the Press Corps on joining the U.S. Army. On being asked "What's your idea of the ideal girl?" Elvis answers with much laughing '"Female Sir". A heavy version follows with guitar/drums and guitar to the fore. There is also a piece of dialogue included from the movie 'Jailhouse Rock' where Elvis has just kissed Judy Tyler (Peggy Van Alden) and she turns to him in disgust and states "How dare you think that such cheap tactics would work with me?" and Elvis replies "That ain't tactics honey, its just the beast in me". Great up tempo closer for the album which is heavy on drums/piano/bass and guitar. Similar type female backing group as the Sweet Inspirations. A very melodious version with Elvis urging everyone on near the end shouting "C'mon, C'mon, C'mon". Finally, I would like to make this important point. To fully appreciate this album one needs to treat it as a whole and not just a conglomeration of unrelated tracks. 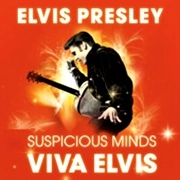 As stated earlier it is truly a unique 'listening experience' and and one that is linked biographically to cover all Elvis eras from 'That's All Right' to 'Suspicious Minds' taking in the 50's, the Movies, the Army, the 68 TV Special and Vegas. Special thanks go out to Erich van Tourneau and his team for this innovative concept in recorded music and to EPE and Sony Music Entertainment for their support for the project. 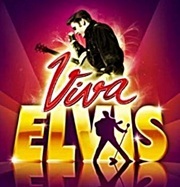 This album will whet the appetite of fans worldwide to go and see the show 'Viva Elvis' when it eventually goes on tour and bring back fond memories for those who have already seen it. I personally cannot wait.